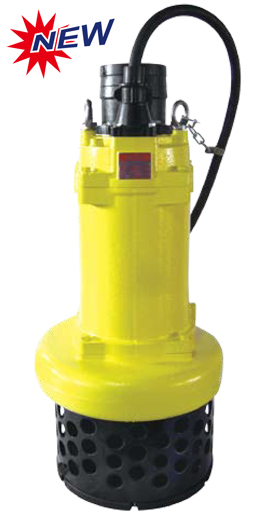 TPS & TPA Series high volume sand pumps – most heavy- duty design with 4-pole motor for handling heavily polluted liquid. The cast iron construction extends pump life by preventing premature wear and failure from the abrasive materials found in mining, aggregate and construction applications. Outlet – 80 mm ( 3 in. ), 100 mm (4 in. ), and 150 mm (6 in.). Fine casting discharge outlet and top cover. Oil-free motor, 3 phase, 4 pole, with thermal and over-current protector. Standard cable:10 m (20 ft.) or longer upon request. Discharge, inlet plate, and impeller are easily inter-changeable for different performance. Rugged cast iron construction holds up to the most severe mining, aggregate, construction applications.